I recently had a conversation with someone carrying out the PAT testing at an English language school and he had come across some dangerous portable water heaters that had been brought in by some of the students. I subsequently found that these water heaters are also widely available on Ebay and Amazon. 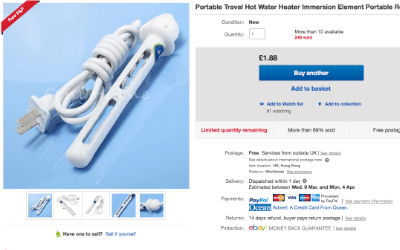 This item was described as a “Portable Travel Hot Water Heater Immersion Element’. The description also gave some interesting details of how it worked - “Due to the magnetic wave action during the heating, after water absorb electromagnetic energy, moisture occurs bizarre oscillation, collision, and after friction, the water rising temperatures”. The heater consists of a plastic housing with two metal plates separated by a gap of about 5mm. 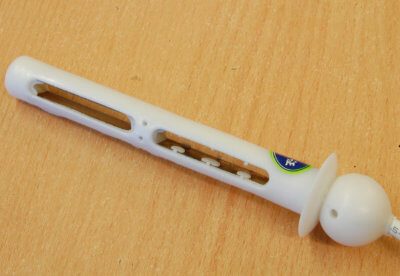 The supply cord is two core 0.5mm2 fitted with a NEMA type plug. They have also kindly included a dangerous adaptor plug to allow it to be fitted to a UK socket. The portable heater is extremely effective and very quickly brings a cup of water to the boil. I first carried out an insulation test with the PAT tester. 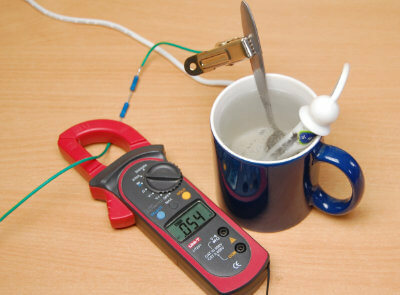 Using a metal spoon as a test point gives an insulation resistance reading of 0.01MΩ, the lowest measurement range for this instrument. This confirms what I already suspect, the two metal plates within the plastic housing are simply two electrodes at mains voltage! With such a low insulation resistance reading, a leakage test will almost certainly trip the RCD within the consumer unit, so instead I carried out a substitute leakage test. This gives a reading of greater than 19.99mA, the upper limit of this PAT instrument. As the substitute leakage current was in excess of the range of the PAT tester, I used a multimeter to test the touch current. 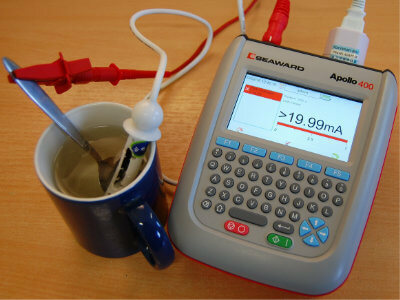 The test lead is connected to the metal spoon and fitted with 2 X 1KΩ resistors (2KΩ). The other end of the test lead is connected to the neutral of the supply to prevent the RCD from tripping. A touch current test with a 2KΩ resistance gives an indication of the current that is likely to flow through the human body. Although the resistance of the human body can vary considerably depending on conditions, tests carried out by the International Electrotechnical Commission (IEC) found that 95% of the population have a body impedance of 2125Ω at 220V. The touch current test on the metal spoon gives a reading of 54mA; enough to deliver a fatal electric shock. 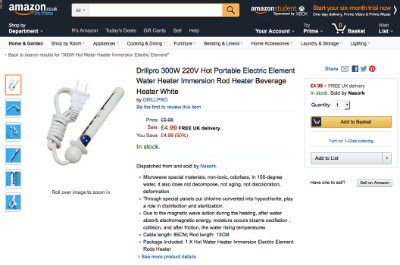 Whilst carrying out further research into these portable water heaters, I came across a kettle using the same live electrode water heating method. bigclivedotcom - Inside a dodgy Turkish "stinger" kettle. This kettle can be purchased on Ebay. 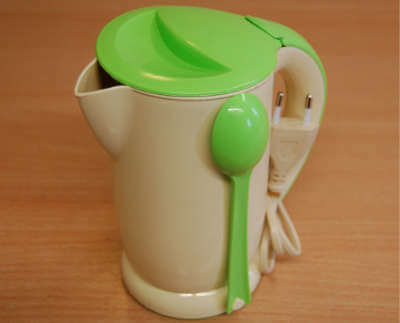 It does contain some warnings in the instructions, including: "When the plug is in the socket, do not put your hand in the appliance or in the water remained in the appliance" and "Never use a metal spoon". Presumably as a safety precaution, the kettle is also supplied with a plastic spoon. 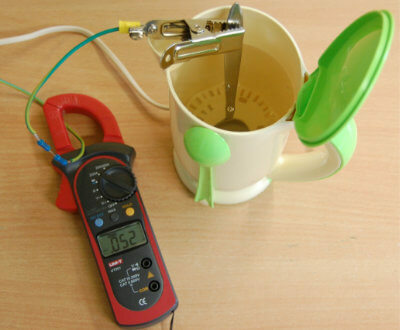 Using the same method as before, I measured the touch current using a clamp meter and a test lead with a 2kΩ resistance attached to a metal spoon. The measured touch current was similar to the previous water heater, 52mA.